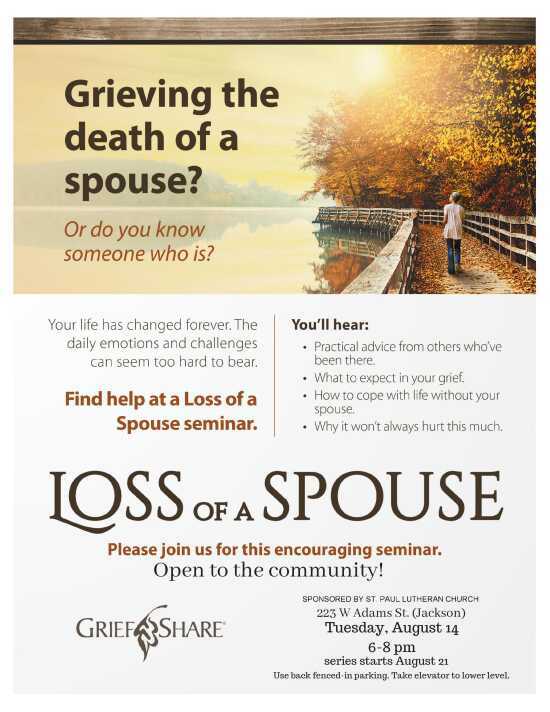 A special encouraging session will be held on August 14 in the St. Paul Lutheran Church (Jackson) Fellowship Hall from 6-8 p.m. for those who have lost a spouse and are seeking support. Beginning, August 21 the 13-week series will start from 6-8 p.m. in the Fellowship Hall. If your spouse died recently or in the last several years, these sessions can be of great help and encouragement. Please bring a friend, neighbor, or family member who has also lost a spouse. Contact: Molly at (573) 275-3744.